Nothing says fall quite like the harvest bounty of apples and butternut squash coming together in this warming Apple Ginger and Butternut Squash Soup. Respect. That is what I have for all those single moms and dads out there. I was solo parenting all of this week as the husband was away for work. My kiddo was pretty well behaved for the most part. In spite of that, there were many many moments when I wished the husband was here. Most times, it was just to mentally check out knowing that there was another responsible adult in the house. Being the only adult in the house meant that I had to be alert and very much present at all times. It got a little exhausting towards the end and I missed the husband even more. It made me realize all over again, what a wonderful team we are when it comes to managing the household and the kiddo. There were also some moments this past week, where it broke my heart, when V missed his papa. There was a time when he told AJ over the phone – “ can you please come back to veedu (house in Malayalam)for one minute please?” I am sure, hearing that was not easy on AJ too. Missing his papa made V a little more clingy all week, something he does not do that often. Somehow, I realized it the first time he did that and once I knew why he was doing it, it was a lot easier. It is also easier now that he can talk, communicate his feelings and all that now. It helps us help him feel better. I made this soup over the weekend and was glad to have some extras of it to take out and heat up during the week. Especially so, because I cook after AJ gets back home when the two of them are playing and it was difficult for me to do that as V wanted me to play with him. It stayed pretty well refrigerated for a couple of days and held up when reheated. I think it got a lot more flavorful after a few days as the flavors kinda got concentrated when it sat for those few days. 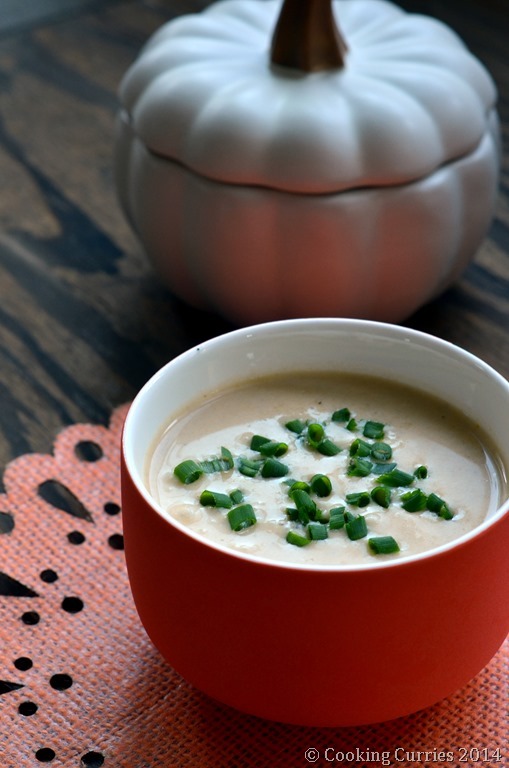 A creamy spiced soup that warms you from the inside out. Heat the butter in a stock pot. Add the leeks and saute till they soften. Add the apples, butternut squash and ginger and let it cook on medium heat for 5 minutes. Give it a stir every once in a while. Add the salt, pepper, nutmeg, all spice, cardamom and cinnamon. Stir in well with the apple and squash. Pour in the vegetables stock and let it come to a boil. Once the apples and squash are cooked through, switch off the heat and let it cool a little. Blend well in a blender (I used my Nutri Ninja blender) and pour back into the stock pot. Heat the soup over low-medium heat. Add the heavy cream and check for seasoning. Don’t let it come to a boil once you add the cream. Serve hot with the minced chives as garnish. I hate the cold weather but I always look forward to a amazing bowl of soup. I have to add this to my list and give a a try. A good soup of soup, warm blanket and a movie is always ideal. 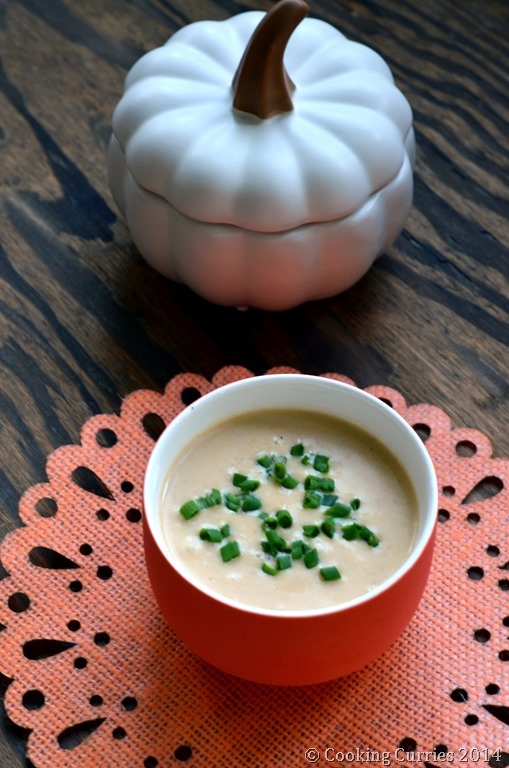 The first time I came across the idea of apple in soups I thought it was crazy. Until I tried it and it has now become one of my favorite ingredients in soup. Oh yeah! I thought the same. I wasnt so sure until I tried it! Nothing like a warm bowl of comforting soup to bring the family back together! 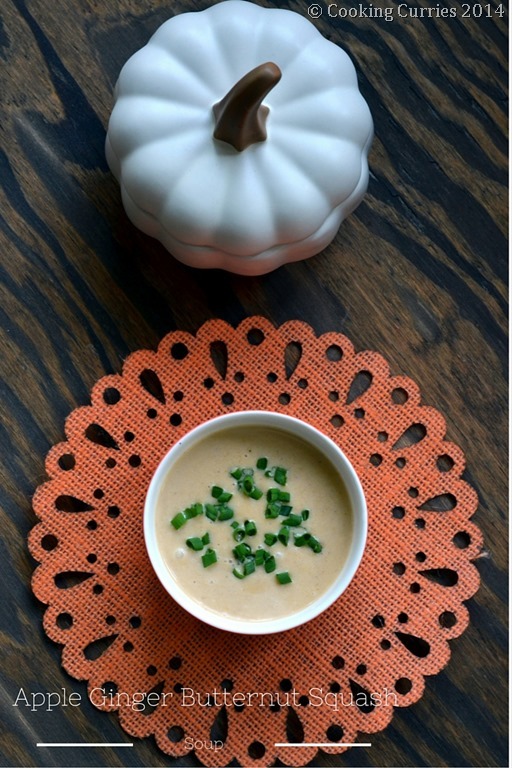 This apple soup sounds divine! This soup sounds and looks so delicious! Perfect for autumn! This looks so fantastic – full of Fall flavor! That soup sounds so creamy and delicious! Now if it would just cool off enough here (in the California desert) to enjoy hot food! I know!!! We are just beginnning to get lucky here in Seattle. It finally feels like fall. Butternut squash? Apples? Warm soup? Sign me up! Love this recipe! Oh wow! What an awesome combination of flavours. This sounds amazing. I have never considered adding apples to a soup but I can see how it has potential. It sounds a little weird at first but wait till you taste it! This sounds so incredibly delicious – and I just happen to have every one of the ingredients on hand! I’m going to try making this for breakfast tomorrow because this sounds like a superb way to start off a cold Seattle day! 🙂 Let me know Brittany! I hope you like it. Is the butternut squash supposed to be cooked first? I would imagine it might, but wasn’t sure …… hope to make this soon, have some squash I need to use! THANKS! Aileen, you just add the squash as it is. There is a step in between where you poyr some stock / water to cook the squash and the apple.